13 Action News found some interesting products at RECon, the global retail real estate convention, underway now in Las Vegas. You may even see them the next time you're at the stores. 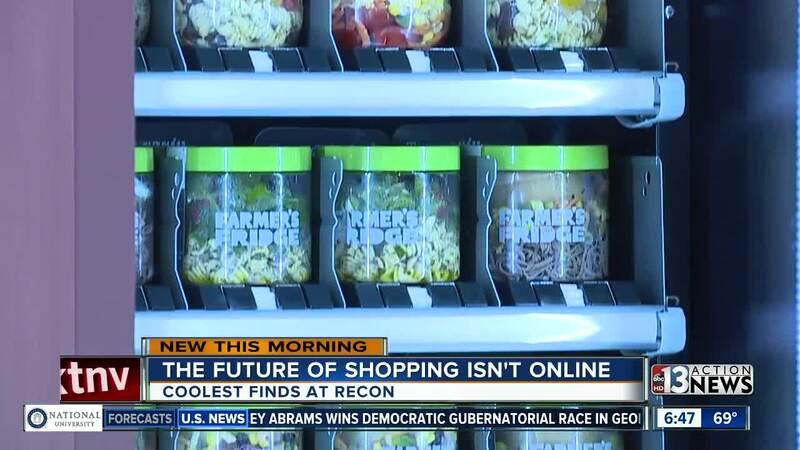 If you thought the future of shopping was all online, think again! The first item comes from Glass-Media and lets businesses put video in a window or glass wall. It's kind of like a futuristic version of window shopping and shows people what a store has to offer, without making them go inside. Also spotted is a touchscreen shopping wall that looks like a mirror. With just a few taps shoppers can buy things seen on awards shows thanks to the mCart software . The Size Stream could be coming to a dressing room near you soon. All you do is walk in and in seconds lasers calculate your measurements and can even tell you what size you are in a certain brand. "What we really are looking for in this case is to reduce that try on experience from maybe five or six different garments down to one or two garments based on a very good understanding ahead of time of what fits," said Jeff Messer, the vice president of sales and marketing for Size Stream. Finally, long gone are the days of vending machines filled with chips and candy. The so-called Farmer's Fridge is stocked full of healthy things like mason jar salads that are all the rage today.